I'm a huge fan of creating a new vision board at the beginning of each year. Since I started three years ago, it's taken me longer and longer to complete my board because I like to make sure the images and quotes will serve me all year long - and it has to be reflective of what I really want to accomplish. Vision boards (especially those made with friends and complimented with wine) can help give you a vision of what to aspire to and what you want to accomplish. I personally like them because my vision board usually help me make huge changes in my life and during rough times, it helps me stay committed to the goals and keep my eye on the prize. 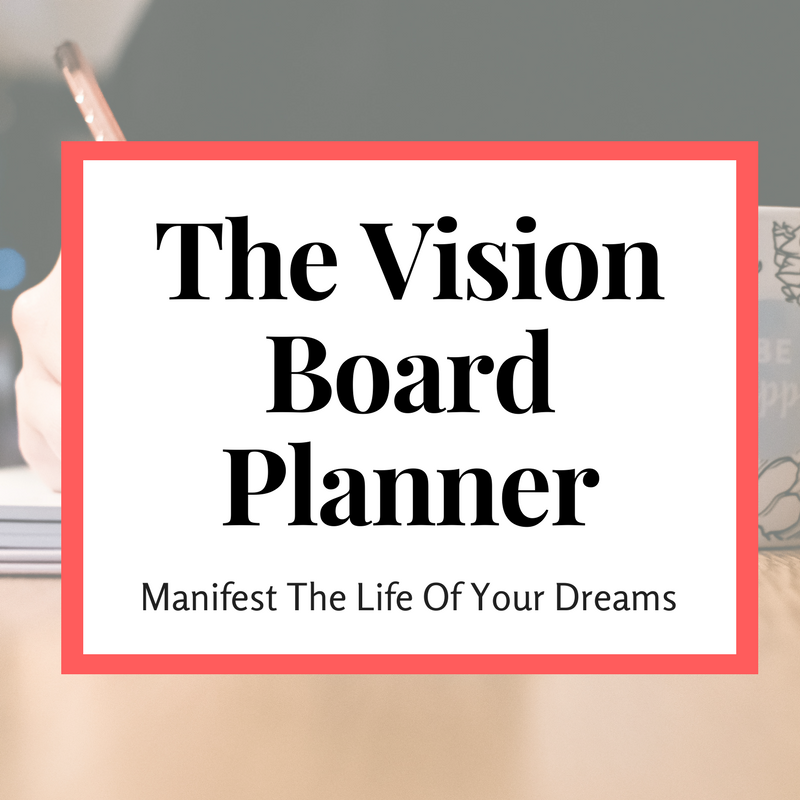 For your vision board to really work in helping you reach your goals, you have to make sure that it is a great representation of what you want to accomplish. In 2017, we're all suffering from major FOMO. You see someone creating an online business or popular YouTube channel, traveling the world or living their dreams (don't even get me started on the friends getting engaged and having beautiful weddings) and all of the sudden you want to see your life go in a similar direction. In reality, you COULD want something completely different, but constantly being connected is keeping you from focusing on your own goals. Self help podcasts + books + articles + gurus tell you what you want... rather than you deciding what you want. No matter where we go, we're constantly plugged in, listening to some successful person talking about how they achieved their level of success... dangling their implied fame + fortune in your face, only for you to try every method possible to reach that same success. When, all the while, their success may not be aligned with your idea of success. Think back to a time where you were on top of your game. You felt great, you were rewarded for your success and impact AND, most importantly you were proud of yourself. What were you doing at that point in your life? Try to make sure those same actions and activities are apart of your big vision. What's the end goal, here? What are you working towards? A year from now, what does your ideal life look like? If you can get clear on what you want, you can create a vision that will help you get there. Show me your calendar and I'll show you your priorities. Sometimes we can get caught in a trap of making everyone around us happy with miscellaneous tasks that have nothing to do with what we want out of life. When you decide what you are going to stop doing (and say "No" to) you get to make more room for the things you say yes to.... and start doing more of the things that will push you closer to accomplishing your goals. Everyone hates going to the Emergency Room because they take entirely too long to get to you UNLESS something has gone terribly wrong and you need help RIGHT NOW. Imagine that every aspect of your life is waiting for you to optimize it in the ER. Look at everything - your personal finances, relationships, education, career and everything in between - and decide which one needs the most attention. Thinking about your priorities like this will help you make the changes that will make a huge difference in your life. Following these four activities to create a clear vision will help you create a vision board that really changes your life. No matter how many people talk about their success using vision boards (the great Oprah included), vision boards can appear from the looks of the materials to be completely non-magical right? I mean, seriously, it's made of white poster board and some old magazine clippings, there's no gold, silver or diamonds involved. But no one can deny, that no matter how flimsy, these little boards with tiny pieces of paper glued to them have the power to change lives. Vision boards have a unique way of keeping your personal goals front and center - and top of mind throughout the year. (There is no way you're going to forget that you wanted a promotion when you have a poster boards that says P-R-O-M-O-T-I-O-N in huge letters sitting above your nightstand.) Every time you look at your goals, you'll think about them - and that gives your mind to think of new ways to solve your largest challenges. When you create a vision board you are forcing yourself to take some time to think about what you really want out of life. That time of internal reflection that you take to cut out all of life's distractions and focus on your personal needs is the first powerful point in accomplishing your goals because you take the time to decide on those goals. You are focusing your mind on what you really want. Then, when your vision board is complete, putting your finalized creation somewhere that you'll be able to see it every day constantly reminds you of those goals throughout the year. 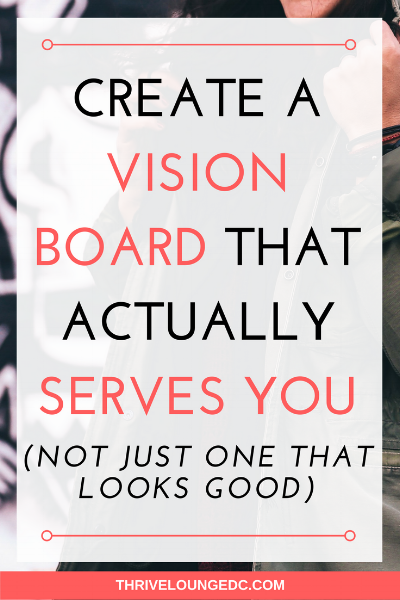 This is great news because you don't have to settle for the white poster board that most gurus opt for when creating their board! Nothing against the white poster board at all, but we're all about being true to you, here! If you're financially conscious, create your vision on a cork board. I'm a huge advocate of being frugal any chance I get so a cord board is my canvas of choice when I create my vision board. I create a vision board every December so I could easily go through 50 poster boards over the course of my lifetime (hopefully many more). However, by my second year of creating a vision board, I opted for a beautiful cork board that I can use year after year. (Pro tip: This also looks really good if you want to hang it up in your bedroom or somewhere else prominently visible in your home.) In the first week of December, I take a look at my vision board and take account of what I've accomplished and what I haven't tackled yet. Then I remove the old quotes and images and re-use that same cord board to build my vision for the next year. For the designers, build it on canva. If you like to journal, build your vision inside your personal journal. If you don't want to share your goals, use an envelope strategy. For the sentimental, stick with the paper - and keep it throughout the years. While I've been tearing down my vision every year to replace it with a brand-spanking new one-year plan, one of my best friends was doing the exact opposite. She was creating her vision board on poster board and keeping it each year. She even had a cute poster board holder that held all of her vision boards from the past to present. With about 4 vision boards under her belt, she could clearly see what goals she was pursuing and how her priorities have shifted over time. Similar to eating a Reese's (and from what I hear, skinning a cat) there's are multiple ways to do it. Just remember that creating a vision board is all about you and the goals you want to accomplish. The most important part about the vision board is that you create it to fit your needs and inspire your inner soul.